Fortunately, if you already had an AKON animation in draft or previously published, all the themes components would still show up in the GoAnimate studio. I think this is still the case too. If you copy an old AKON animation that you've made and rename it, you can still make new AKON videos. I don't know why the theme has vanished but I really wish GoAnimate would bring it back. As I've said previously the characters within it are some of the best drawn on GoAnimate. Moving on to the final part 5 episode, I knew this was going to be the conclusion. It had been many months since part 4 and I just didn't want to drag out this series any longer. Given my writing style of making up the story as I go I'm pretty proud of just how well everything comes together in an ending that is completely satisfying yet, like all great endings suggests this may not be the end. I remember when I made this, the opening scene of Rashy flying down from space I completed fairly soon after part 4 and then I got really stuck. I didn't know what Rashy's lair really looked like or how I'd get Agent A and Barack onto Rashy's trail. All I knew is that I had Super Rica refusing to rat out Rashy at the end of episode 4. Rashy was still mad at Bush and Cheney and that the trick alien glasses hand controller I set up way back in episode 1 still hadn't been put to good use. All of this kept me stuck for months - which is why these characters made a special appearance in Moonlighting - TET's New PA to complain about the hold up on their series. Sometimes to get out of writer's block with a comedy you just have to drop a piano from a great height and see how the characters react. In this case, my Piano was Brittany Spears crashing a Ferrari into Rashy's flying saucer. It's a little random but it worked in with the idea that any human could be an alien in disguise (just like Bush and Cheney) and Britney did have a thing for accidentally crashing her car into things at the time. This got things moving with Barack and Agent A and it took George and Cheney out of the story in a natural conclusion that meant they didn't need to be saved from Rashy. Also this episode continues the whole joke of Agent A dancing every time he uses the phone. 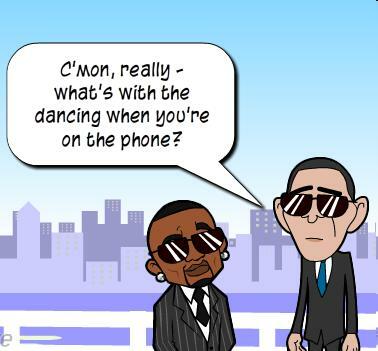 It's really the one thing Barack has over Agent A that he knows will annoy him. In previous episodes I'd already established Rashy as a master of disguise - even though he never disguises himself at all. I also established that Barack could see through Rashy's disguises way back in episode 2. Both points provided some great comedy in the chase into the subway where Rashy finally gets to use that trick controller to lose himself in the crowd - the first time you could say he actually does disguise himself. This segwayed nicely back to the interrogation room where Roy and Agent K are trying to break Super Rica into revealing Rashy's lair. Once Barack and Agent A are told of Rashy's lair it's a great opportunity to once again point out the two agents are walking everywhere. I'm noting it here because I use almost the same running joke in my later Bat Storm: Financial Crisis series. Who said a good joke can't be recycled! Rashy's lair was an interesting development. In episode 3 I established Rashy had a lair with a dungeon like room where we first see his new, improved killer robot. At the time I hadn't thought about what the exterior of his lair might look like. Then I had a brain wave of continuing to self reference my other animations - as MIB does by bringing Rashy into it in the first place. Thus Rashy's lair became the same castle complete with the same Witch that I used in my earlier series, How to get views the Evil Genius way (episode 2). The premise of that episode was that the Witch had purchased a flying monkey army (which all looked like Rashy) with monkeys that couldn't actually fly due to their wings being fake. Rashy kind of takes over her lair (because he's just that resourceful) but when MIB track him down the Witch tricks Rashy into using the wings to fly away. Stroke of genius - if I do say so myself. This meant I could recreate my favorite scene from the How to get views episode - a monkey jumping straight out the tower window only to discover the wings don't work - and have Rashy just drop into Barack and Agent A's hands - literally. No need for any big confrontation or final battle - and it works beautifully because it's funny and completely logical. From there it was easy to tie up the loose end of what happens to Rashy since the MIB movies, which this series parodies, established the whole memory erasing ability that MIB has. I like that the whole script comes full circle for Rashy and he's back in his room where his megalomania began way back in The Boss of Everything. To sum up the whole series, this my first full length script for any animation. That is, something that tells a complete story with plot twist and turns untill finally everything is brought together in a satisfying conclusion. I learnt so much constructing the story that I later used when creating the first episode of Bat Storm. It's a body of work that I'm most proud of.